Tariffs have often been at the heart of recent political discourse. The current administration has moved the USA’s economic policy towards a more protectionist direction in order to protect American interests. Many key areas of trade have fallen victim to this shift in policy, however, without a doubt auto imports have been the one most affected by it. The issue has been such a common talking point that it may be worthwhile to take a look around the world at what underlying economic reasoning could possibly either justify or refute the enactment of these tariffs. The World Trade Organization (WTO) database of global statistics serves as a good place to start looking for answers to the question. Studies on tariffs and other trade barries have their own chapter among the WTO’s many reports. These easy to compare studies compartmentalize international trade into simple categories based off their Harmonized System nomenclature. The figures of interest to us are the ones in section XVII. which contains summary data on land-, sea- and air vehicles as well as their respective parts, components and accessories. The first chart, seen below, shows a comparison of the average and maximum tariffs per country for the industries in question. These stats are significant because they reflect how many partners each given country has trade agreements with, since the maximum tariff is only applied to countries with which they have no deal to grant more favorable terms. The first thing to note here is that neither column is visible for Japan. This isn’t the result of some error, but rather the fact that Japan, one of the leaders of the world’s auto industry, has in fact a 0% tariff on import cars, thus both the average and the maximum are zero percent. This tariff policy also reflects well how open the country’s economy is, since lower tariffs make their domestic market more accessible. The final two columns represent the average of all the 147 countries examined by the WTO. 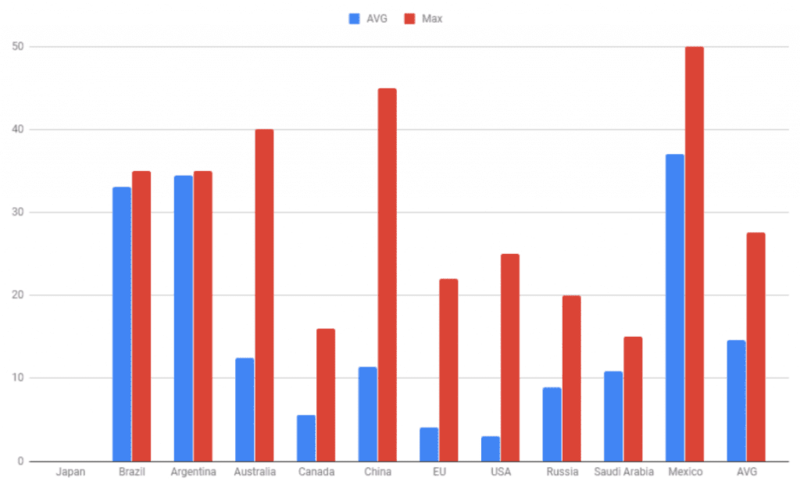 The maximum US tariffs in 2017 were fairly close to the global average, however, actual tariffs as seen on the other column shows them to be the lowest after Japan. This means the US rarely exercised the full legal extent of its tariffs, instead preferring to either make individual deals or be part of large overarching agreements that provided exemptions to its trade partners. Canada and the European Union both have similarly low average tariffs, while China does not. The latter rival is much closer to the global average and their tariff policy is distinctly protectionist. While it’s no surprise that developing countries in South America for example would offer very incentives for import, China has the second highest maxi tariffs after Mexico, although they also enforce them to a much lesser extent. 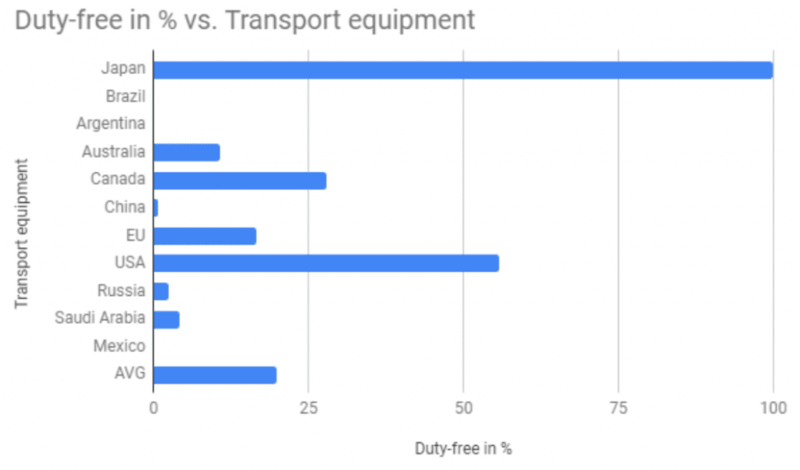 To gain an even greater understanding of the actual situation, we can take a look at the percentage of transport equipment imported to each individual country duty free compared against its total imports. On closer inspection we can find even more evidence of the USA’s previously extremely favorable tariff policy. Other than the tariff-free Japan, the USA had the highest percentage of duty-free imports, meaning that tariffs were only paid on less than half of all transport equipment imported to the states. While this result is an excellent example of trade openness, in reality this trade policy may have contributed to US trade balance being, without any exceptions, perpetually in the negative since the 80s. As a matter of fact, the only time it even had a deficit of less than 30 billion dollars over the past 10 years was during the 2008 crisis. This begs the question of whether the current administration’s economic policy can really be called a move towards protectionism or if it’s a simple regression toward the mean from a state of accessibility and low tariffs that was already far ahead of the rest of the world. The rest of the world’s developed countries still routinely apply their tariffs, even if they typically try to keep the max somewhat low. China for example gives very few exemptions from tariffs to importers so only 0.8% of products enter the country duty-free. In the USA’s case that number is 55% and for the EU it’s 16.5%. Latin America on the other hand is not fond of playing favorites, they tend to apply import tariffs to everyone. Ultimately the WTO’s figures reveal that the USA is very much an open economy, possibly much more so than its opportunities afford to be. Obviously as the flagship of capitalism it has to support free and open trade, however, it also has a definite interest in correcting how skewed the above charts look and that just may end up hurting other countries’ wallets.